We have our experience in delivering end to end Document Management services to several domains and majorly Telecom. We understand how important Documents are to the telecom business and completely empathize with the principal companies to keep strict compliance with the regulatory requirements. Our quality assurance processes ensures result oriented output at all times. Team of highly skilled managers and association with technological companies are the assets of our process. We leave no stone unturned in the areas of Infrastructure, Technology, quality manpower, training, workflow & analytical tools. Less Storage space for preserving the documents. Reduction in overall Searching time. Increase in productivity of processes and office personnel. Availability of the document for sending over email. Reduced turnaround time of processes. 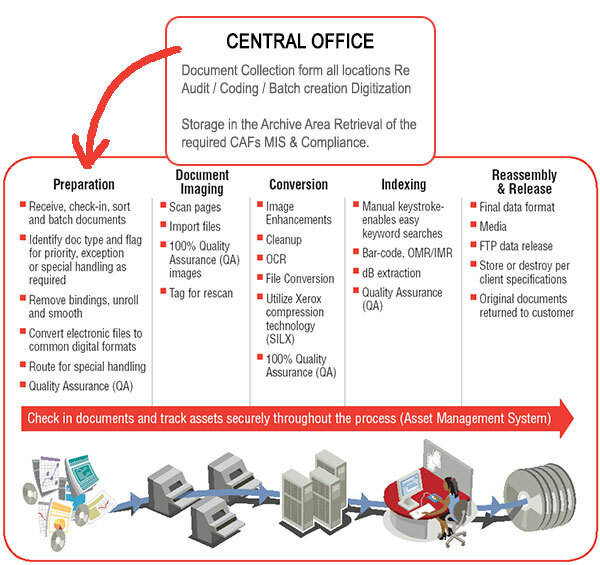 Increase control over all the important digitized documents by restricting access.